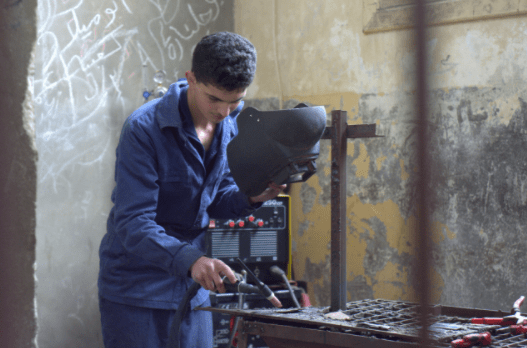 Shuaib working at his technical school in Al-Qadmus, rural Tartous. Syria, Tartous, 25 February 2018 – Shuaib had just finished his national Grade 9 French exam, and was heading back to his home in Al-Qadmus in rural Tartous, coastal Syria. Waiting at the crowded bus station with other students in Tartous city, Shuaib heard a loud explosion and felt piercing pain in his neck. A car bomb had detonated in the area. “I felt the shrapnel hit my neck and so I instinctually ran towards the exit, but the second blast followed,” recalls Shuaib. More shrapnel penetrated Shuaib’s knee and thigh, knocking him down. He found himself bleeding on the ground, but could not see anything around him because of the dust. “I took off my belt and tied my thigh firmly,” says Shuaib, recalling the horrific experience from almost two years ago. “I was getting dizzy and losing so much blood, so I took cover under a wooden board,” he adds. Shuaib was rushed to the hospital, where he underwent surgery to remove over multiple shrapnel from his body. One had cut an artery in his neck; another broke the cartilage of his knee, while a few damaged the main nerve in his thigh. Back home, Shuaib’s mother was getting worried, waiting for the regular call from her son to let her know how he did in his exam. “When I saw the suicide bombing on the news, I thought that he was killed,” says Samasem, Shuaib’s mother with tearful eyes. “I rushed to the hospital and found him on a bed soaked with blood, but I was happy to find him alive,” she adds. Although in severe pain, Shuaib was determined to sit for his final exam in Arabic, only three days after the attack. “He was willing to take the test even if he had to go on a stretcher,” adds Samasem with a proud smile. Shuaib’s father brought him his textbooks to review at the hospital. “It was very hard to concentrate because I was dizzy and in pain all the time,” recalls Shuaib. “But I still had ambitions to fulfill,” adds Shuaib, now 16. Shuaib was allowed to sit for his exam on his hospital bed, managed to pass his Grade 9 exams with good grades and signed up for vocational education, which is his passion. “Ever since he was a child, Shuaib would take things apart, or collect parts to make gadgets like mixers and vacuum cleaners!” remembers Samasem. “Now I study hard every day to qualify for the Higher Institute for Applied Sciences and Technology to eventually major in aircraft engineering,” jumps in Shuaib. Although every day brings Shuaib a little improvement, he still suffers limitation to his movement. “I like playing sports and being active, but the damage in my left thigh does not allow it,” he says. “Sometimes the pain is too much that I can’t even walk, but the fact that I made it through this ordeal makes me more determined to realize my dreams,” he continues.